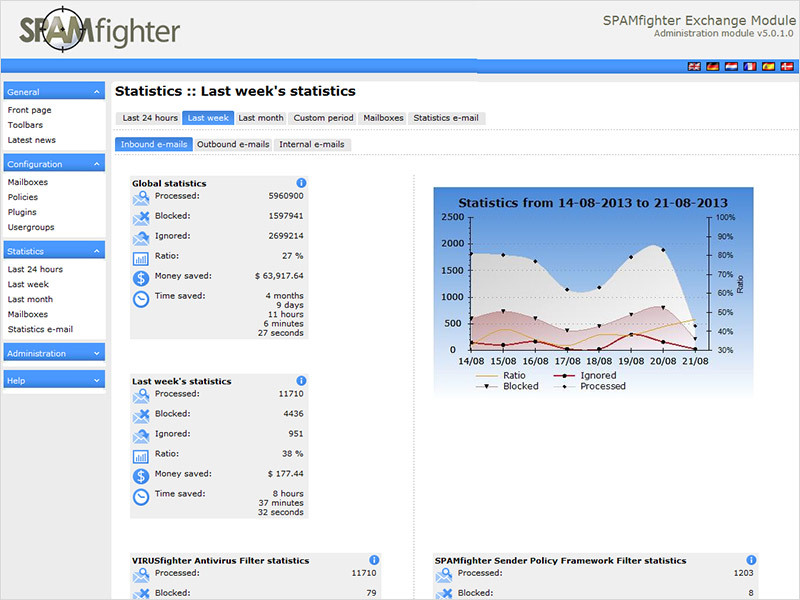 SPAMfighter Exchange module also offers reporting, so administrators can review statistics on how many messages SEM is filtering, how many users are enabled, and more. SEM is available in multiple languages: English, German, Danish, Dutch, Spanish, French and Greek. SPAMfighter is Microsoft Gold Certified partner. Panda Security for Enterprise provides the most advanced proactive protection in a multi-tier flexible architecture covering all layers of the network. Panda Security for Enterprise includes protection for desktops, roaming users, file & e-mail servers, ISA servers and MTAs. The centralized console unifies the information and allows administrators to manage risks by offering real-time information to keep them alert to threats. Protects against viruses and other malware using industry-leading technology; Scans all Web, e-mail and instant messaging traffic in real-time; Provides an unmatched detection rate of new threats based on two different proactive technologies; Blocks spyware programs that track your online activities. For businesses and organizations that operate their own mail servers, Frontgate Perimeter Defense accepts incoming mail for your domain, removes spam, viruses and other malicious content and then forwards email to your mail servers for delivery. In this scenario, Frontgate acts as a perimeter firewall, effectively shielding your mail servers from the Internet. 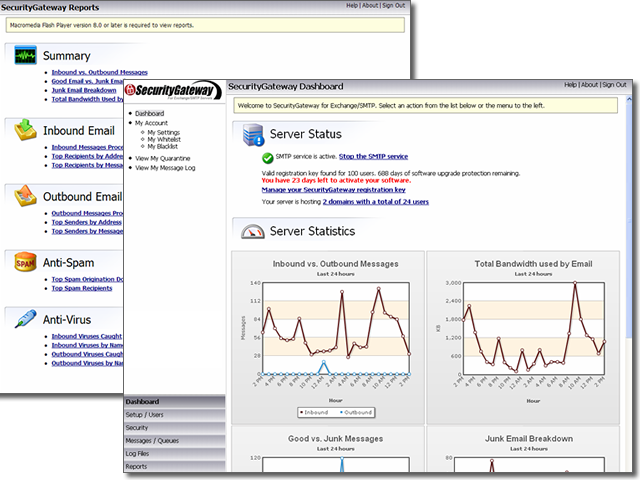 Frontgate Perimeter Defense protects Internet-facing mail servers by eliminating the threat from anonymous connections. Frontgate identifies and stops spam, viruses and malicious traffic at the perimeter to ensure that your network is always protected. Trend Micro’s InterScan Messaging Security Suite protects your network by integrating antivirus with zero-day protection, anti-spam, and anti-phishing along with content filtering for compliance and data security. This software solution is delivered on a single, scalable platform with centralized management for email security at the gateway. Sophos Email Security and Control protects against inbound and outbound threats delivering high-capacity, high-availability security against spam, phishing, viruses, spyware and malware. Features: Blocks viruses, spyware and phishing; SXL real-time anti-spam defense; Prevents data leakage; Integrated policy enforcement; Includes expert 24/7 support.